With the new school year right around the corner (my students come back Monday! ), lesson plans are flying out of printers and teachers are frantically looking for ways to integrate technology. Here are a couple of quick and easy ideas to help you start off your year with technology integration. They are everywhere. This is a QR code. 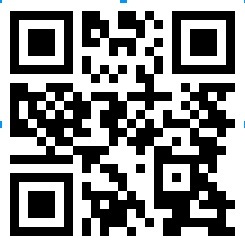 Very simple, it is a "picture" of a web address that a special app on your phone called a QR reader can read. It will take you directly to a website. In this case, it takes you to a Google Form that I have created. Google Forms are a great way to gather information, do an anonymous survey, or have people RSCP tp events. These are only a couple of examples of what you can do with a Google Form. In fact, I have evne created a Google Form for our school that allows teachers to submit their lesson plans by answering a few simple questions. So why not start of the first day of school getting to know your students with a getting to know you survey? Post signs around the room with the QR code (you can also post a link for students who do not have QR readers) to a survey in Google? Or create a scavenger hunt. Students have to find 10 items. Post twice as many posters around the room with QR codes that link to unrelated items. Students can partner up so no one is excluded. To create a QR code, I use the site www.goqr.me . You create a poll, either multiple choice or open ended, and have students use a cell phone or computer to send in their reponse. Poll updates real time and can be displayed on anything connected to a computer. This is a virtual bulletin board. You can pose a question and have students share their responses. Great way to check for understanding or encourage participation from students who do not like to speak out in class. Poll Everywhere & Padlet take very little prep time (10 minutes or less) and are easy to use at any time. The QR codes & Google Forms take a little more prep time (30-60 minutes), but are very effective technology integration tools and can be used over and over. All three can be used to check for understanding, promote classroom discussions, and in general, make the class room more interactive. There are many more AWESOME tools out there for integration, and I will get around to discussing them eventually. These three are just the quickest and easiest, and most importantly, FREE! The most important thing to rememer with technolgy integration is that it has to work for YOU and your students. If you hate it, don't use. Technology integration should be fun and exciting, not something you dread more than a staff meetings.